In their wildest dreams, Democrats never conceived that Congressman Devin Nunes's Central Valley congressional seat would ever be up for grabs. Call Congressman Nunes a dream maker! The congressman has single-handedly made Donald Trump's dream of having a stooge on the intelligence committee skulk around the White House grounds in the middle of the night to deliver/receive/receive/ deliver a propaganda document to be then spilled into the media's bloodstream a reality. 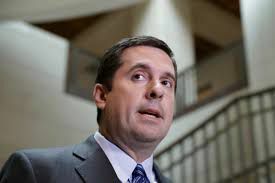 Additionally, in a feat that shows real dream making powers, Nunes has simultaneously made the Democratic vision of taking over his once-safe congressional seat almost tangible. Nunes may be popular on Fox News and uber-conservative blogs, the voters in his working-class agricultural leaning district are not impressed with his new found fame. While the district boasts a slim 9% Republican to Democratic registration edge the presence of active area voters in that do not belong to either party makeup 25% of the electorate. The no-party voters are younger, significantly Latino and have no love for Trump or his cadre of Nunes like cronies. But before we celebrate the fact that Democrats can catch the dream of this elusive seat we must remember that they can also blow this historic opportunity. Case in point: DC political insiders are pushing centrist Democrat and former prosecutor Andrew Janz as the best Nunez opponent. This while a viable and more progressive candidate, Bobby Bliatout, who manages local non-profit community health clinics, is the local favorite and has won the lion's share of endorsements from elected officials in the district. With the help of DC consultants, Congressional candidate and avowed centrist Andrew Janz has been taking the Party by storm glad-handing ( and allegedly at times bullying) his way through endorsement process after endorsement process relying on an uninformed and myopic vision of the Central Valley district. Congressional candidate Janz has coaxed influential D.C. based Democrats into believing that the district is politically center-right based on an analysis of GOP to Democratic registration that avoids the leanings of a coalition consisting of progressive Democrats and voters who disdain any political party. Consider the fact that voters in the district overwhelmingly voted for a progressive healthcare funding initiative. 62% of the voters in the district voted to permanently extend a Medi-cal hospital fee program that provides health care for low-income Californians despite a multi-million dollar campaign against it. While Republicans may have a slight registration edge, the coalition of Democrats and non-aligned voters far overwhelms any GOP constituency. You would think that a non-profit healthcare executive like Bliatout would be a natural but the D.C. Dems are continually convinced their candidates need to be Republican light to win. What makes Janz's center-right instincts most apparent is his inability to articulate his position on the immigrant Dreamers. While Janz initially stated his support for the inclusion of DACA in the recent federal budget debate during an endorsement meeting he flipped on the issue on a local broadcast program. To make matters worse while he flipped he is yet to flop back to the position of strident DACA support. This positioning is befuddling based on the fact that his district is highly dependent on immigrant labor and it's even more conservative business voices support immigration reform. One must surmise that Janz's personal feelings about immigrants and their children combined with his prosecutorial background are smothering his full embrace of DACA. Contrast Janz's weakness on DACA with Bliatout's outspoken advocacy for it. Bliatout's clear articulation of the principles at stake in the debate is a clear indication of why local activists and elected officials have rushed to endorse the non-profit healthcare executive. DACA is not the only example of the instinctual differences between Bliatout and Janz. Recently a student at a local high school was verbally abused by a teacher when she did not stand for the pledge of allegiance. The student remained seated during the pledge as an act of protest against racism. In response to the exercise of her 1st amendment right the student, Thalia Luna, was told by her teacher to "go back to Mexico". Luna's roots are Mexican and Laotian. As soon as the incident was reported by the Fresno Bee Bliatout publicly jumped to the defense of the student. In response to the racism inflicted on the teenage student, Janz was predictably silent. In an age where progressive Democrats are demanding attention and no party preference voters have no preference because they resent the games that politicians play Janz is a not winning choice. If no-party-preference voters and Democratic voters have indicated anything, it is that weak-kneed politicians have no way of gaining their support. Recent history across the country indicates that the dream of catching the 22nd congressional district will not be realized if the old Democratic centrist approach of the 90's is utilized in the raucous information-saturated age of 2018. Special elections from Virginia to Missouri have shown that local issues combined with progressive passion are the winning formula of 2018. Bliatout is that combination.